The mere fact that I’m writing these words about Julia Ivanova’s Family Portrait in Black and White means something has gone right. That is to say, on the occasion of its theatrical release, no longer is this film one of those special little treats that bounced around the American festival circuit for over a year, only to drift into oblivion forever. Granted, this release won’t be wide, but to know that a film like Family Portrait in Black and White will be playing in a Times Square multiplex alongside franchise blockbusters in the dead heat of summer should give us all a tiny breath of hope. 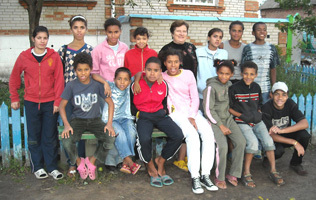 Based on its thumbnail description, Family Portrait in Black and White sounds like a zany docu-riff on “The Old Woman Who Lived In A Shoe”: in the Ukraine, the aging Olga Nenya has become the foster parent of seventeen children, most of whom are mixed race/black orphans. Cue 85 minutes of wacky antics! But while moments of sweetness and charm abound here, the deeper reality is far, far different. Ivanova takes no time in letting us know from the beginning that in the Ukraine, not everyone thinks Olga’s set-up is so loving and sweet. Not only do the outright racist skinheads—of which there appear to be a shocking number in this country—think that true Ukrainian people are, and should always be, purely white-bred, and not only do the ignorant drunken neighbors feel this way, but it appears that even the most regular Ukrainian citizens share this hard-to-fathom belief. As in, how in the hell are you supposed to tell a kid who was born and raised in the Ukraine and has never lived anywhere else that he isn’t actually Ukrainian? Complicating this argument is a scene in which, after a barrage of candid interviews in which white Ukrainians explain that these black orphans aren’t in fact Ukrainian, one of Olga’s own black kids goes on a rant about Arabs and foreigners—even black ones, which he refers to by using the n-word—and how they are invading and ruining the country. To see this youthful confusion already spinning itself into a backhanded form of self-hatred is quite dispiriting. You want to shake and hug this child, but you also understand why he is saying the things he is saying. Along those lines, Ivanova helps viewers along by explaining the roots of this orphan problem: many African male college students come to the Ukraine for schooling, and, of course, while they are there, flings happen. But when they leave the country, the Ukrainian woman is left behind. Only now that she is without a husband and is carrying a black child, her shame is doubled. Without fighting for her child, she abandons it to “save face.” While that sounds terrible, what about the absent African fathers? Aren’t they equally responsible for this predicament that creates so many unwanted orphans? Well, not necessarily. For example, Ivanova introduces us to the father of two of Olga’s kids, Roman and Erik. It turns out he desperately wants to bring his children with him back to Uganda to live with him. Yet he can’t. To do this, he must submit to a DNA test to prove that each child is his, and each DNA test costs five thousand dollars. Of course, he doesn’t have that kind of money, and so the kids are forced to live with an overwhelmed foster mother instead of their biological father. Ivanova’s film is filled with murky layers like these. She won’t give viewers any space to resort to knee-jerk judgments and moralizing. This approach extends to Olga herself. At first, you might be thinking that this woman is a human treasure, but as the film unfolds, we begin to witness her exerting a proprietary relationship over her kids in which not all her decisions appear to be for the most noble reasons. Once again, in contrast to the colors in the film’s title, Ivanova refuses to paint an easy black-or-white/right-or-wrong portrait. She isn’t trying to say that Olga is an outright saint, or that these kids are all little angels, or that it’s the government’s job to help her out, or anything else. She is simply being honest with regards to the aching complexity of this situation, which makes for an altogether more humane experience. Having now firmly established that Family Portrait in Black and White is far from a cuddly, uplifting assemblage of “adorable, zany antics,” I should also make it clear that Ivanova, who is credited as writer, director, cinematographer, and editor, somehow manages the tricky feat of nonetheless establishing—and maintaining—a light, bouncy atmosphere throughout. This can be most directly attributed to her brisk editing and the nearly constant inclusion of pop music on the soundtrack. While those creative decisions might seem contradictory on paper if you consider what the film is actually about, here they inject it with a breeziness that keeps us floating above the water. Otherwise, we might drown with sorrow.